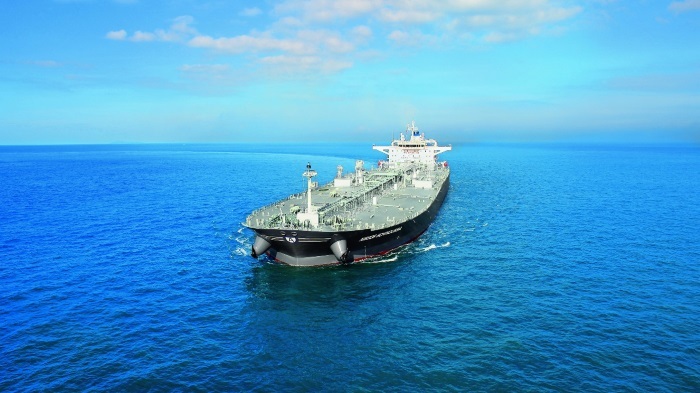 SCF Group (PAO Sovcomflot) has signed time-charter agreements with Shell for two dual-fuelled Aframax tankers, which mark a historic turning point that set new environmental standards for the global tanker industry. At a ceremony held yesterday during International Petroleum Week in London, the time charter agreements were signed by Evgeny Ambrosov, Senior Executive Vice-President of SCF Group, and Mark Quartermain, Vice-President of Crude Trading for Shell. The vessels are part of a series of six SCF Group tankers currently under construction and due for delivery between Q3 2018 and Q1 2019. 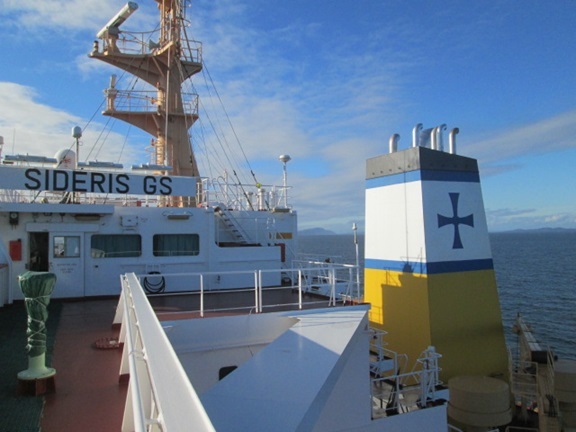 The two tankers will be on time charter to Shell for up to 10 years, with a minimum commitment of five years. 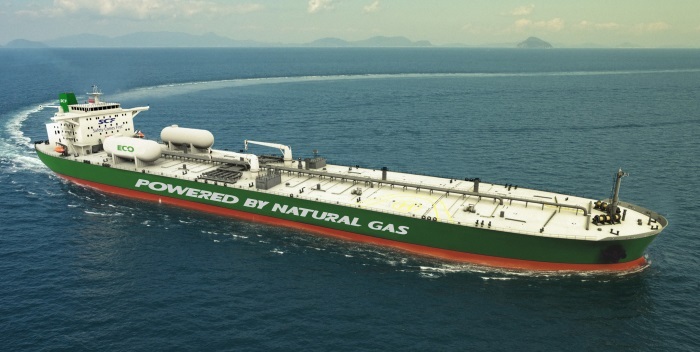 This “Green Funnel” series of ice class 114,000 deadweight LNG-powered Aframax tankers will operate within Shell’s extensive global freight trading network. The vessels will also use Shell’s specialised LNG bunker vessels, such as the Cardissa, for fuelling in North West Europe. Shell will provide further supply points across North West Europe and the Baltic as it expands its LNG fuelling infrastructure. 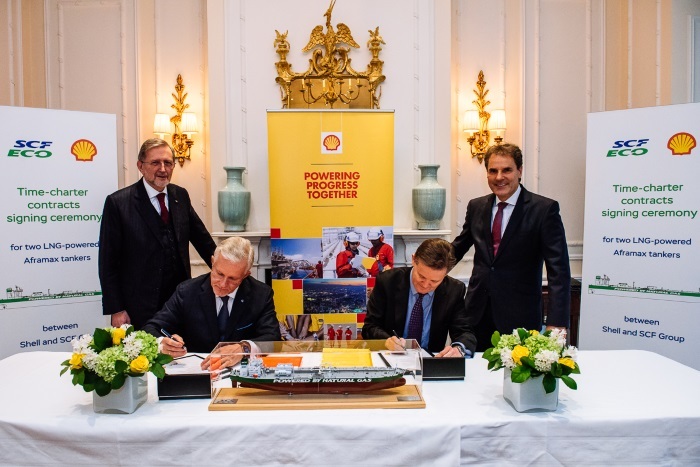 The signed agreements represent the next step in an extensive top-to-bottom collaboration between SCF Group and Shell over the last three years around reducing the environmental footprint of the tanker industry, in particular, by fuelling tankers with LNG. 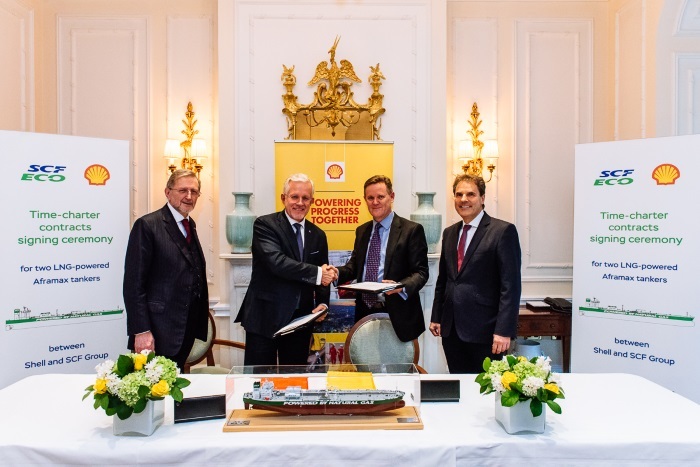 The new contracts follow the ground-breaking LNG Fuel Supply Agreement between Shell and Sovcomflot concluded in 2017, which pioneered the expansion of Marine LNG fuelling into the tanker industry and, in general, for vessels not tied to fixed routes or set timetables. From left to right: David Moorhouse, member of the Board of Directors at Sovcomflot, Chairman of the Committee for Innovative Development and Technical Policy of the Board of Directors; Evgeny Ambrosov, Senior Executive Vice-President of SCF Group; Mark Quartermain, Vice-President of Crude Trading for Shell; Dr. Grahaeme Henderson, Vice-President for Shipping and Marine at Shell. Please credit any photos used to SCF Group. In concluding these contracts, both SCF Group and Shell seek not only the safe and economically efficient transportation of oil by sea but also look to improve the emissions footprint of such shipments by exceeding, rather simply complying with, ECA zone emission regulations on carbon, sulphur, nitrous oxide and particulates pollution output from their vessels. 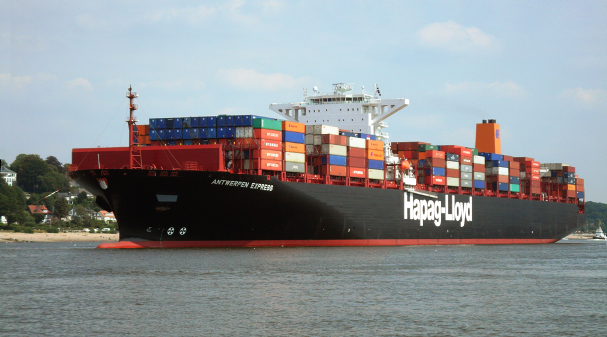 Each tanker will have an ice class 1A hull, enabling year-round export operations from the Baltic. The technical specifications for these new vessels have been developed by SCF Group’s own engineering centre, with the close involvement of Hyundai Heavy Industries, the world’s leader in Aframax construction, and Russian shipbuilders (Zvezda shipbuilding complex, Primorsk region). Their design draws upon the Group’s significant experience of operating large-capacity tankers under adverse climatic and ice conditions of the Arctic and sub-Arctic seas, as well as the Baltic. 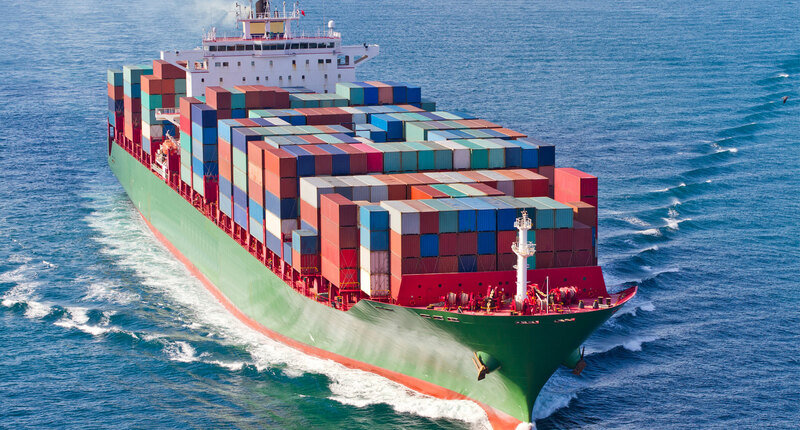 Total carbon emissions using LNG fuel can be reduced by 27 per cent, with sulphur emissions reduced by 100 per cent, nitrous oxide emissions down 85 per cent and particulate matter emissions reduced by 100 per cent. The vessels’ main engines, auxiliaries, and boilers will be dual fuel, capable of using LNG, and the vessels will also be fitted with Selective Catalytic Reduction (SCR) technology to comply with Tier III regulations governing NOx emissions when in gasoil fuel mode.